On the plane of Shandalar, in the city of Lesh, a man walked the streets, rambling about evil horrors. That, in itself, was hardly remarkable. Lesh was no stranger to that sort of behavior. The city was a cesspool of corruption, thievery, and murder; a reflection, some said, of a mysterious and evil god they claim founded the city centuries before. The god was long gone, but his stain still covered and twisted Lesh, home to cults dedicated to Xathrid demons and agents of the Vaasgoth vampires. The city would have been avoided by most, of course, if not for its position on one of Shandalar's most vital trade rivers. The merchant guilds ruled the city, along with a fair deal of the city's underworld—which sported some of the most legitimate criminals one could find on the plane. It was those very merchants who the rambling man, yelling loudly of insidious creatures, walked up to and grabbed by the robes, shaking each in turn. He demanded they listen, as if the elderly, portly fruit vendors were his only chance for survival. His pleas of, "You have to listen to me!" only made his case worse, as the merchants took it as a cue to ignore his incessant rambling. The merchants, ever wary of such madness, would have immediately alert the guards if not for the polished and no doubt expensive jewels the rambling man wore around his neck and wrists. A man clearly struck by that sort of madness would not have usually garnered such respect nor drawn attention, not in a place such as Lesh, but when he wore a year's worth of income loosely around his neck, the merchants tended to be a bit more understanding. As the merchants in their stalls formulated their plans to curry the man's favor and thieves drew their daggers in dark alleys, a young woman bumped into the raving man. She wore a leather outfit, outdated in style from a nobleman's perspective, but refined enough in a beggar's eyes. "Oh, pardon me, Sir," she said. "You! Will you help me?" The man wore a soldier's uniform reminiscent of far-off Thune, but it was dirty and smelled as though it had been the man's home for some time. "What's the problem?" she asked, putting her hand on his shoulder. "The skep! My girl, we must warn the others of the skep!" He never noticed that one of his necklaces had been clipped and slid into the woman's hand. "They sound terrifying!" she said, putting her hands over his, sliding his rings off his fingers. "I believe I've heard of them." "You have? Please—no one believes me." He stared intently into the woman's eyes. Another man stopped to address the pair. He had longer black hair and wore a leather patch over his right eye. His brown leather clothes were detailed with the chitin of an albino insect, similar to the insectoid parts that made up the lyre he wore on his back. "I believe you, Sir," said the man, "for I have fought and killed many skep in my time." The woman grew red and glared as the new competition moved in on her mark. "Have you now?" she said, through clenched teeth. "Why, I felled near seven before breakfast," he said with a smile. "I will listen to your tale, gentle soul." "Oh, bless you both," the addled man said. "Sir, it looks as though you dropped a gold coin," the newcomer said. He reached down and plucked a coin from the ground—copper, painted gold—and placed it in the man's hand while he simultaneously removed one of the golden bracelets on the man's wrist. In the same fluid movement he slipped to the side to pick the man's pockets. "Oh, I see, thank you." The disheveled man stared at the coin. Over his shoulder, the newcomer flashed a broad smile at the woman, who clenched one fist and placed her other hand on the man's shoulder. The newcomer, mirroring her movements, placed his hand on the man's other shoulder. The soothsayer, however, was so enamored by the coin that he failed to see his audience was in contention. The merchants, wary of the two stripping the man of his treasures and eager to take their own turn pilfering the soothsayer's possessions, finally moved to alert the guards. If they weren't going to get their share, then why should anyone else? "Jalira and Yisan, step away from that man!" A voice echoed through the market. Jalira, the woman, and Yisan, the man with the eye patch, looked at each other and sighed. The commander of the guards rode toward them on a horse with six other soldiers, two of whom already had drawn bows aimed at Jalira and Yisan. "Jalira, place your hands in your pockets. Yisan, if you so much reach for that lyre I'll have an arrow through you before you strum your first note." Jalira placed her hands in her pockets and Yisan crossed his arms. "Why hello, Dexros," Yisan said, moving his hands as he spoke, knowing it would cause the guards trepidation as they tracked his movements. "What seems to be the problem?" "We've reports you've been robbing in the market." Jalira's face turned from annoyance to compassion as she raised her eyebrows and stepped forward. "Please, Sir. We are only helping this poor soul by stealing his wares, so he doesn't end up with a dagger in his back. We are doing nothing but our civic duty," she said. The addled man looked confused, then noticed his gold was missing. He didn't seem to care, instead turning to walk over to the nearest smiling merchant, continuing to rant about impending doom at the hands or claws of the skep. Jalira and Yisan rolled their eyes at the loss of their mark. "You are under arrest," said Dexros, commander of the guards. "Come with us or else we will issue a warrant of execution against you." "I've already got a warrant of execution," Jalira corrected. Yisan looked over at her, dismayed. "Why do you always make things difficult?" Yisan turned to the guards. "We will not being going with you." Dexros moved to signal his men to attack, but just as he opened his mouth to order the archers to fire, Yisan hummed a tune imperceptible to human ears. Yisan preferred playing his lyre, but any instrument would do, including his voice. Five panicked horses reared up, throwing three riders to the ground, and bolted through the marketplace. Two of the guards barely hung on to their steeds. The guards on the ground moved to get up and charge the duo, but Jalira waved her hands, wafting blue smoke from her fingertips. 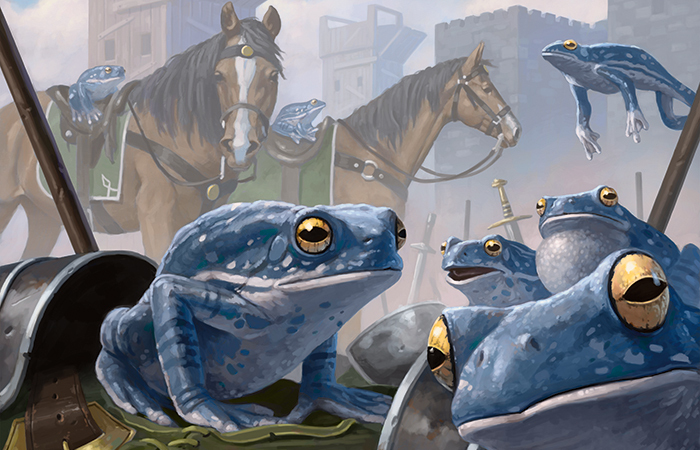 The guards transformed into tiny blue frogs, their empty clothes falling around them. Yisan shot Jalira a disapproving look. "The flies were bothering me," Jalira replied, smiling. Yisan rolled his eyes. He was about to retort, to scold her for interrupting his melody, but the sound of more guards down the street caused their ears to perk up. "I think, Jalira, it's best we take our leave." After escaping the city, Jalira and Yisan made camp next to a small river on the side of the road, a few miles from town. Jalira drank water from a skin while Yisan stood on a rock, reading a book while he hummed. "Must you continue that tune?" Jalira asked. "Last time we travelled together I had that song stuck in my head for weeks." Yisan didn't respond, instead humming louder and louder, until he was singing, prompting Jalira to pick up a rock and throw it at the bard. Yisan, never looking up from the book, jumped down from the rock and walked over to Jalira. "It seems the man we robbed was a Thunian scout named Hastric," Yisan said as he waved the book in front of Jalira. "This might be the solution to our financial problems." She snatched the book. "What financial problems?" she asked, sounding exceedingly unconvincing to Yisan, who smirked as Jalira opened the book to read. "No, that's sliver," Yisan corrected, jumping from the ground back to his boulder. "Your greedy mind betrays your eyes." On his lyre, Tolumnus, he strummed the same tune he had been humming. Jalira dismissed his correction and continued to read about the slivers. She had heard rumors of strange creatures that evolved rapidly, but her research into physiology halted when she ran out of money to feed her test subjects—and herself. Hastric had taken it upon himself to study the slivers, but he the writings in Jalira's hands suggested he slowly began to lose his mind, it would seem, due to what he initially called the "hum." Later writings, which became more erratic and paranoid, referred to it as a "thrum." The final scribbled entry simply referred to it as "the call." But contained within the notes were reports of dead merchants and travelers in the deepest parts of the sliver network, merchants and travelers who left behind piles of gold and other jewelry waiting to be plundered. Jalira's cheeks reddened and her pulse quickened as she read. 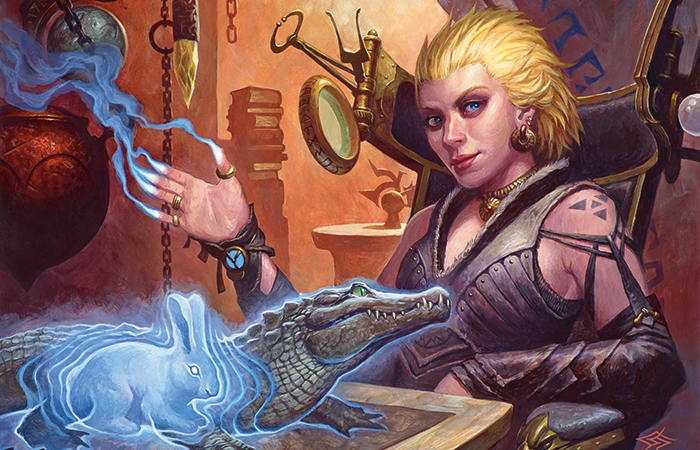 Not only could she study unique and incredible creatures the civilized world hadn't seen, Jalira realized, but she could make a small fortune as well. "Well, let's go then," Jalira said, tossing the journal at the still-playing bard. She was still smiling, although her grin was as false as ever. Yisan caught the book with his strumming hand, cutting off the song. "It will take us deep into the Kalonian Wilds, well past the Onakke ruins." Yisan said. "So we better get moving." Yisan fastened Tolumnus on his back and hummed the same familiar tune as the pair began down the road. The journey was more difficult than expected. Early on, Yisan and Jalira were beset by a pack of beasts corrupted by dark magics, creatures that had only recently begun to plague the land. Jalira turned a few into rabbits while Yisan tried to calm them. His music did not affect the beasts, so he charmed massive centipedes from beneath the earth. During the ensuing fight, the pair escaped. After a night spent with a particular and mathematically minded mining company, Yisan and Jalira swung wide of the coast, taking extra time through the Kalonian Forest to avoid Talrand's aerial patrols. Neither counted the drake summoner as a friend for a variety of differing reasons: between the two of them, Talrand had been cheated out of twenty gold bars, the deed to a lighthouse, and a marriage. Yisan had spent some time in the Eloren Wilds, which were certainly dense and dangerous, but they did not house as many terrifying or feral beasts as those in Kalonia. Although it tired him and annoyed Jalira, Yisan played a light tune on his lyre as they hiked into the deepest part of the Kalonian Forest, keeping the hydra and tuskers away, but causing his fingers to bleed as he played for hours on end. Eventually, through no small effort, the pair found themselves near the area marked in the journal. It was not the exact location, but the distinct sound of chittering and buzzing Hastric's journal described confirmed the proximity of the slivers. The buzz rang in their ears. Yisan and Jalira pushed their way through brush, finding themselves facing a cliff with a cave. Above, along the cliff and into the cave, hung the slivers, similar to Hastric's maddened sketches. Hastric called them the "less brood," although they were still close to Jalira and Yisan's size. They slithered and hung from the rocks above them with their tails and singular clawed arms in the centers of what Jalira discerned to be their chests. "I don't think my music will work here," Yisan whispered, glancing in Jalira's direction, without taking his attention off the hive. Jalira was annoyed he had spoken, but she knew what he said was true. There were at least a dozen slivers, and their bizarre clicks would surely drown out Yisan's songs. The pair, assured only by the fact that Hastric had survived there for months, slowly walked forward. As they crept into the cave, several slivers slid down the rocks to bar their path. The slivers didn't move quickly or aggressively. Their heads didn't even seem to follow the pair. Yet every sliver before them raised its bladed arm in their direction. 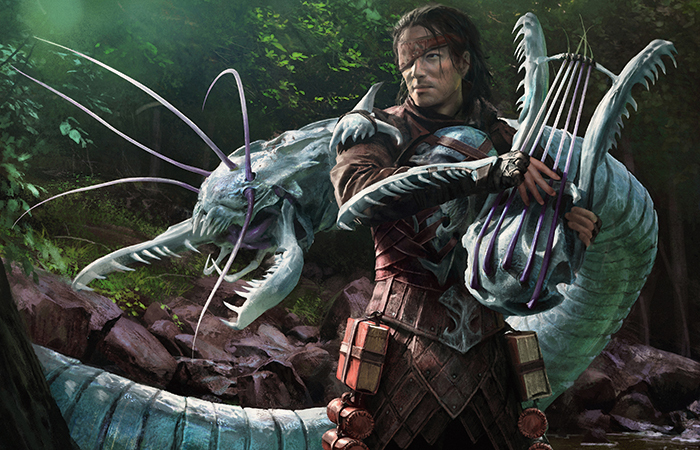 "I have a plan," Jalira whispered, trying to hide her smile as she studied the creatures. "I don't like it," Yisan replied. Blue smoke began to flow from Jalira's fingertips. All they know is the hive. The hum of the nest. The will of the hivelord. They fight it, Jalira and Yisan, their minds racing to control their new sliver bodies. They are those of the lesser type. They can hear the thoughts of all in the hive—a constant hum. 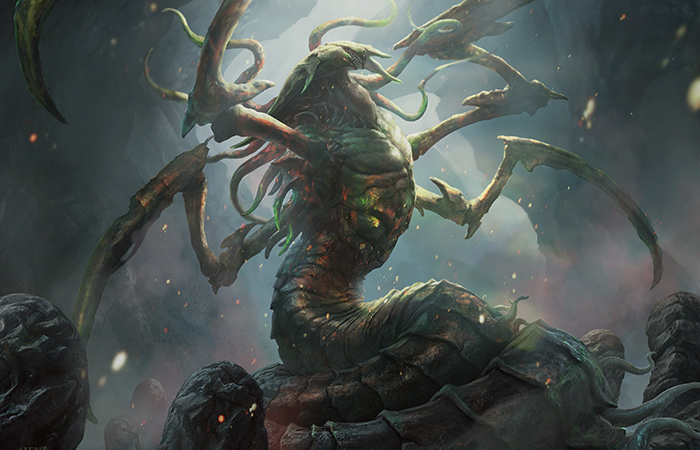 As they move through the hive, they lose themselves, succumbing to the will of the hivelord. They lose each other, forgetting who they are. They catch their thoughts, briefly, and rush back to one another, trying to stay out of the constant urge that seeks to make them drones. The hive is all and all is the hive. After a few minutes (hours? days? ), Yisan and Jalira began to recover their bearings. Control of their own free will slowly crept back. 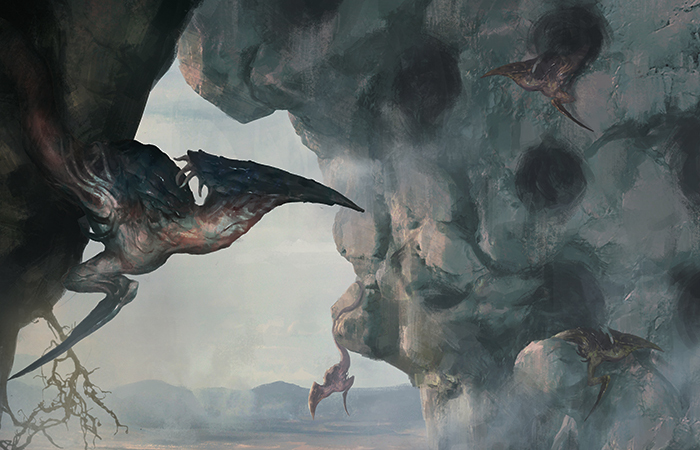 They moved past the bipedal and humanoid "primes" Hastric described, which looked like the sentient races of Shandalar but moved like insects, the chittering intense and loud. The pair, still moving as slivers, came to a larger chamber with alcoves lining the ways, in which strange biomasses were tended by lesser slivers. A sliver rode the wind with wings there, spiraling down from the top of the chamber to the bottom. As it passed by another sliver, that sliver, too, grew wings and momentarily hovered. Jalira and Yisan felt the wings pop out of their backs, felt the new parts form from their bodies, and knew how to fly as if they had done so their entire lives. As they moved toward the center of the hive, however, they lost their wings. Sometimes they grew extra blades or began to secrete venom, which disappeared as they moved inward. After some amount of time they could not fathom, they arrived at the central chamber, the hub of the hive's activity. The sliver hivelord towered in the chamber, a massive creature twenty times their size. Hastric had mentioned it was the source of the slivers, their liege. The bones of the dead—and, more importantly, their gold and possessions—laid at the edges of the chamber, remnants of the hivelord's feasts. Jalira and Yisan entered the chamber, but their sliver forms began to waver. The hivelord somehow willed them to abandon their façade. It seemed to observe them, its blades moving almost independently of the swaying, snakelike body. Naked, Jalira and Yisan kept their eyes on the hivelord, terrified, but stole glances at one another for any indication of what they should do next. Not knowing what to do, they both bowed to the hivelord. The massive sliver made no reaction. Without words, they both backed toward the walls of the chamber and cautiously grabbed the remnants of clothing lying there. They dressed and, careful not to forget the purpose of their journey, slowly procured as many coins and treasures as they and their pilfered clothes could carry, all while keeping their eyes on the hivelord. The slivers did nothing to allow Jalira and Yisan to pass, although neither did they actively try to stop Yisan and Jalira's exit. The two, no longer invisible in their disguise, avoided the primes, whose humanlike heads turned to look at them as they passed. Eventually, after carefully waiting for slivers to move out of their way, they made it back out of the lair, into the woodlands, to where they had left their clothes. "We need to get to Martyne," said Jalira, breaking the silence. "Grendub will be able to front most of this." "I think I'm going to stay here for a while," Yisan replied, his head turned toward the cave. He picked up Tolumnus. "I want to study them a little more. Their music is fascinating. You can take all the treasure." Jalira made no eye contact with him. "Yeah, sure, I guess," she said. "If you trust me. I'll keep the gold we make, but I'll only stay in Martyne for a few days." Yisan didn't seem to hear her. He stared at the cave, strumming his harp to mimic the sounds of the slivers. "That works. I'll catch up with you in a bit." He sat down to watch the slivers hanging from the rocks and strummed his carapace lyre. Jalira wanted to say something else, but pride forced her to leave without a word. She was not going to waste her time on foolishness. She knew what she needed to know about slivers. She set off for Martyne and hoped she remembered the annoying song Yisan always got stuck in her head.